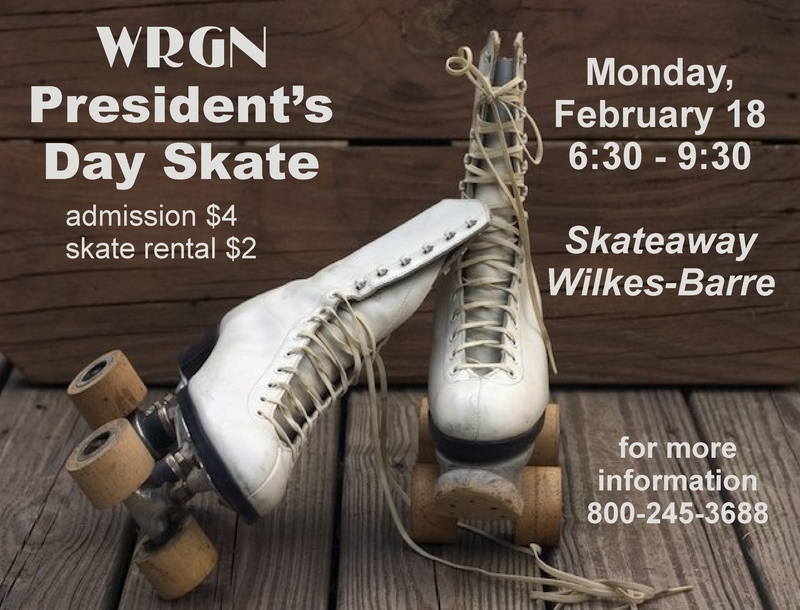 Come out to the WRGN President's Day Skate on Monday, February 18...It gets underway at 6:30 PM! Three great hours of rollerskating to your favorite Christian music, and a time of devotions mid-way through the evening with Pastor Bryan Krauss of Cross Creek Community Church! It will be held at Skateaway in Wilkes-Barre. Admission is $4, and skate rental is an additional $2. If you have them, please feel free to bring your own skates. All proceeds from the evening will benefit WRGN - listener supported Christian radio since 1984! If you'd like to help promote the skate, feel free to download the Poster PDF and spread it everywhere. There are smaller versions of available, so you can print them out and put them in your church bulletin, or hand them out to family and friends. We've also provided a PowerPoint slide to put into your slideshow presentation - if that's how you "roll". To download the PDF or the slide, right-click on the link, and choose "Save Link As". Any questions, please call us at: 1-800-245-3688.